Following on from earlier Gaelic workshops funded by Clì Gàidhlig, Aberfeldy and District Gaelic Choir is piloting a new conversational Gaelic learners course developed by Clì Gàidhlig. The 10-week course covers topics such as how to obtain services in a shop or restaurant, hobbies and pastimes, time, numbers, directions and being able to give descriptions and uses a variety of methods to deliver the lessons. 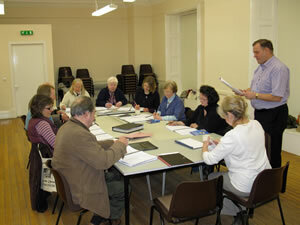 Eleven members of the choir and 3 members of the public have been attending the course in Aberfeldy. Clì Gàidhlig courses can qualify for ILA200 funding through ILA Scotland. Further information can be obtained on the Clì Gàidhlig website.